Connect with God – God is Amazing! There are so many ways to connect with so many people today. In a way, it is good, and a blessing, but it is also a distraction. I have found myself many times using the time I had set aside for God to connect with other people in the rest of the world. Instead of studying my Bible I find myself browsing the Internet, without purpose. It is so important to make it a priority to connect with God before you connect with the rest of the world. It’s important to say, “OK, it is now Bible study time, and that’s what I’m going to do.” I have found myself saying, “Well, I’ll just check my email first.” and then I get distracted. I am working on not doing that, on knowing my tendency to get distracted, and not giving in to it. I know that if I open my computer it usually takes some time before I shut it again. Therefore; I don’t open it. It is a long process, and I am by no means saying that I have completed it, but it is one that needs to be started. If it’s your phone for you, then leave your phone in the other room and then go do your Bible study. It’s hard, we have become so addicted to electronics that we push to the back of our minds this idea of unplugging for a while. It is really important to conquer this addiction though, because we are so busy looking at pictures of everyone else’s lives and reading about them that we miss the ones that God has put right in front of us! 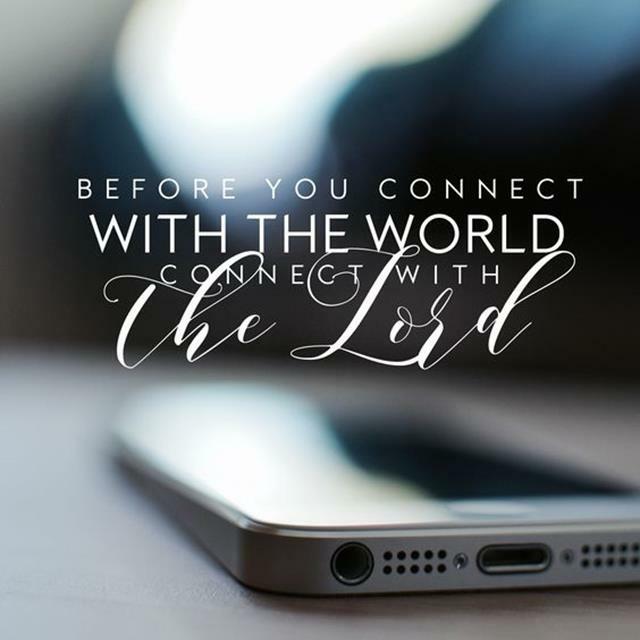 It is so important to be able to disconnect from social media and texting and to reconnect with God, and our families. The average person spend around 5 hours a day on their phones. They can’t put them down, they can’t leave them home while they are someone else. It is a serious problem! That’s 5 hours that we could be spending with real people, 5 hours that we could be doing something nice for someone else, 5 hours that we could have spent with God, or family, or friends. When I first heard this average I thought, “Surely I’m WAY below that.” Then I got this app that tells you how much time you are on your phone? I was below the average but way over my expectations. The first day I was on my phone for 2 hours! I was shocked, and determined to lower that number. Now I average about 30 minutes a day, which is still a lot, but not quite as much. Sorry guys, this is a very long rant that kind of ambles all over the place! Please help the people of this world to disconnect from the screens and reconnect with You and the people You have placed in their lives. It’s hard sometimes, but with You we can do anything! Thank You for forgiving our sins when we ask, and please help us to sin less! *The app mentioned above is called Quality time. This is not sponsored.